October 26, 2011 - Cirrus Aircraft expands flight training globally, on Tuesday the company opened its first full motion flight simulator in Poznan, Poland. Cirrus' first European SIM Center will offer state-of-the-art simulation training for the Cirrus SR20 and SR22 aircraft with Cirrus Perspective by Garmin avionics. The company's flight simulator expansion now provides pilots throughout Europe a practical and safe method for logging hours toward certification or re-currency training in a Cirrus aircraft never before available. In the Cirrus Aircraft SIM, pilots will have the opportunity to fly in a real Cirrus Perspective cockpit with all active functions and safety features, including a Cirrus Airframe Parachute System (CAPS) handle. The European SIM Center will allow pilots to take advantage of all of the innovative features such as the luxury automotive ergonomics, pilot-friendly avionics, and advanced safety features that Cirrus Aircraft is known for. The simulator is intended to train European pilots who are new to flying or new to Cirrus flying; improve proficiency of current Cirrus pilots; provide transitional training for Cirrus pilots who are upgrading to the full glass cockpit; as well as for Cirrus pilots seeking recurrent training. Training in the simulator can be conducted in any European language. "The introduction of the European simulator in Poland is a critical component to our expansion," said Dale Klapmeier, CEO of Cirrus Aircraft. "This European SIM Center now gives us a larger Cirrus Aircraft and general aviation market footprint which allows us to efficiently train current and future Cirrus pilots throughout Europe." 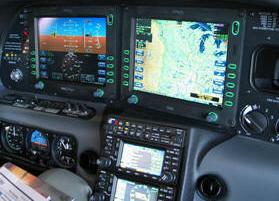 Cirrus Aircraft is a recognized leader in general aviation. Its all-composite line of personal aircraft the SR20, SR22 and the turbocharged SR22T incorporate innovative and advanced performance, electronic and safety technologies, including Cirrus Perspective by Garmin avionics and the unique Cirrus Airframe Parachute System (CAPS). As of mid-2011, total time on the worldwide Cirrus Aircraft SR-series fleet surpassed five million flight hours with 48 lives saved to date as a direct result of CAPS being a standard safety feature on all Cirrus aircraft. The Cirrus Vision SF50 jet, with nearly 500 production positions reserved, will provide a new personal and regional business transportation solution the personal jet. All Cirrus aircraft are made in the USA with a direct sales force in North America and authorized sales centers covering export markets in 60 countries around the world.